1V. López (e-mail: vlopez@tid.es), B. de la Cruz, Ó. González de Dios, and J. P. Fernandez-Palacios are with Telefónica I+D, c/ Don Ramón de la Cruz 84, Madrid 28006, Spain. 2O. Gerstel is with SDN Solutions, Israel. 3N. Amaya, G. Zervas, and D. Simeonidou are with the High Performance Networks Group, University of Bristol, Merchant Venturers Building, Woodland Road, Bristol BS8 1UB, UK. 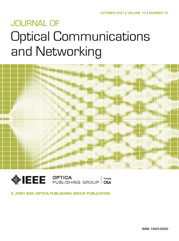 Elastic optical networking (EON) is a solution that promises to improve infrastructure utilization by implementing flexible spectrum allocation with small spectrum slots instead of the rigid 50 GHz fixed grid of current dense wavelength division multiplexing deployments. This new EON flexible grid supports bandwidth variable transponders (BVTs) that can tune their bit rate and bandwidth dynamically with a trade-off between reach and capacity. However, when BVTs need to transmit at low bit rates, part of their capacity is wasted. Therefore, the sliceable bandwidth variable transponder (SBVT) has been proposed, which can provide even higher levels of elasticity and efficiency to the network. SBVTs enable transmitting from one point to multiple destinations, changing the traffic rate to each destination and the number of destinations on demand. The aim of this work is to identify the target cost of 400 Gb/s and 1 Tb/s SBVTs to reduce, by at least 50%, transponder costs in a core network scenario. This target cost is calculated in relation to estimations for BVTs of 400 Gb/s and 1 Tb/s (non-sliceable). In light of our results, cost savings of 50% are feasible for 1 Tb/s transponders until 2020 with a higher cost than non-sliceable transponders. Savings of 50% for the 400 Gb/s case are possible in the short-term before 1 Tb/s SBVTs can appear in the market. Feasibility of such savings with a target cost higher than current non-sliceable transponders shows that SBVTs can be a reality. Moreover, this work assesses the IP port savings thanks to the utilization of the SBVTs.